Watching an E. burchelli swarm move through the forest is an amazing experience. The swarm pours forward amoebically, scouring the leaf-litter, bushes, and climbing high into trees. Despite being almost blind, E. burchelli are highly effective foragers, catching and killing nearly every small creature they find in their path. The first sign of the approaching swarm is quiet a jumping and scurrying in the leaf-litter as insects begin fleeing for their lives. The first army ants arrive as a small trickle. Individual workers run forward, extending the pheromone trail very slightly before turning quickly back the way they came. As each ant turns, another passes it extending the trail a little further. Small insects begin to appear, flushed by the arriving invaders. A burst of red leaf-litter ants, larvae clutched in their mandibles, run for their lives up the nearest plant stem. The steady trickle of army-ant scouts grows and thickens to a flood and suddenly the leaf-litter boils with terrifying ferocity as tens of thousands of ants cover the ground. A spider, flushed from its home, flees frantically, finding no escape. Jaws clamp down on every limb and soon the only sign of life is a tight, dark pile of stinging ants. An earthworm spasms and jumps, flinging ants in all directions, but its movements only attract more attackers until it is quickly stung to death and cut into pieces. A cockroach staggers from a hole, ants clinging to all sides and then collapses, swiftly becoming another thick pile of busily working ants. As the front slowly passes, a maze-like network of trails develops behind it. 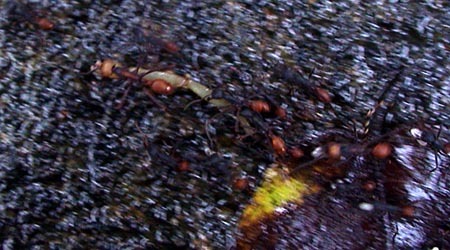 Ants carrying small pieces of prey enter into the steady stream of workers running down the long trail home. Three Eciton burchelli workers carry a scorpion leg in tandem. carry quite large pieces of prey and reducing processing time.